From All-American Girl to Fresh Off the Boat. In the 20 years between Margaret Cho's All-American Girl and the announcement that ABC has picked up Fresh Off the Boat, there's been an influx of content created by Asian Americans on new media platforms. When ABC cancelled All-American Girl, there was the implication that putting an Asian-American family on network television just wasn't going to work. "It was an idea that was good, but it didn't execute well," 8Asians blogger and co-editor Joz Wang told me over the phone last week. "Nobody wanted to touch the subject again. Why else would it have taken 20 years [for Fresh Off the Boat to happen]?" Joz has a point: the sharp criticisms from inside and outside of the Asian-American community contributed to the downfall of All-American Girl, and the show never got a chance to fix what went wrong. And yet, the hunger to see more Asian Americans on the small screen never went away--a desire amplified by the rise of YouTubers from comedian Ryan Higa to beauty vlogger Michelle Phan. According to a 2011 New York Times article, three of the top 20 most-subscribed-to YouTube channels belonged to Asian Americans. One look at the documentary Uploaded: The Asian American Movement, and you'll see exactly what's going on: without a space at the "mainstream media" table, a new generation of artists went to another table that was created with the goal in mind of reaching audiences directly--audiences that might not go to the movies often or subscribe to cable television. Content creators on YouTube get to stay in control of the product they put online, and that's undoubtedly appealing for the Asian-American community. 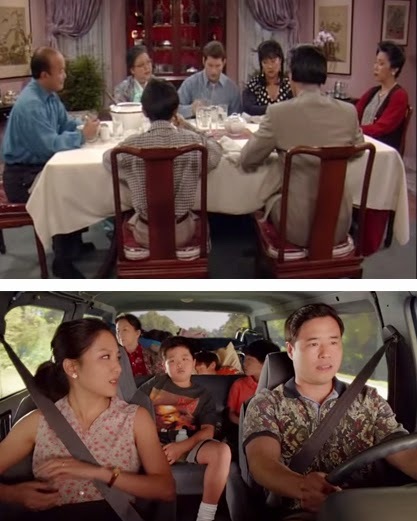 In 2012, Wong Fu Productions premiered a four-episode TV series on YouTube called Home is Where the Hans Are in which a Caucasian guy comes home after an extended period abroad to meet his new stepfamily, who turns out to be Chinese. "Hopefully you don't just see this as an Asian show," the guys at Wong Fu wrote on their blog when promoting Home is Where the Hans Are two years ago. "Yes it has Asians in it, but it's not just Asian jokes and stereotypes. It's about emotions everyone can understand and a family trying to reconnect." The same I think will be true for Fresh Off the Boat. It's about a family too--one searching for the American dream in a place that doesn't always feel like home while trying to stay connected to their roots and to one another. When I think about my own family, I see that search reflected. And I don't think this is something confined to just one ethnic group--America, as an immigrant country, is made up of folks just looking for that big break. If you look at the other family sitcoms ABC picked up along with Fresh Off the Boat--Cristela and Black-ish--you'll see that "American dream" storyline too. The landscape of traditional media is changing, and it will keep changing; the question now is how Hollywood keep up with the clear demand for diversity on the big and small screens. My NBC News piece: New TV Shows Feature More Diverse Faces, Will They Survive?